Samsung Galaxy Note FE is the refreshed version of the Galaxy Note 7. Samsung recalled all the Galaxy Note 7 units, fixed the battery issue and released them as the Galaxy Note FE. The device was warmly welcomed by the Samsung users. It’s running quite well at the moment. The Galaxy Note FE is a powerful device having the top-notch specifications of the year 2016. Galaxy Note 7 FE has a 5.7-inch QHD display and 515 PPI. It is powered by Exynos 8890 mAh and Mali-T880 GPU. The Galaxy Note FE has 64GB internal storage accompanied by a RAM of 4GB. This device has a 12MP camera at the back and a 5MP camera on the front. It has a 3200 mAh battery inside. The Galaxy Note FE comes with its iconic S-Pen. Galaxy Note FE came out running on Android 7.0 Nougat. Recently, Samsung updated the device to Android Oreo. Recently, a friend of mine told me that he was having an issue with his Galaxy Note FE’s touchscreen. I did my research on the issue and found that Touchscreen issue is not the only one that the Note FE owners are facing. There’s a huge list of Galaxy Note FE problems. The problems are very common as several users reported about them. These common Galaxy Note FE problems include WiFi disconnecting again and again. Battery draining very fast is among the issues. The phone’s performance doesn’t remain as smooth as it was on the first day. The Bluetooth connectivity issues are there. The camera does not capture very good pictures or it often fails to capture. I responded some of the people and the solutions worked for them. 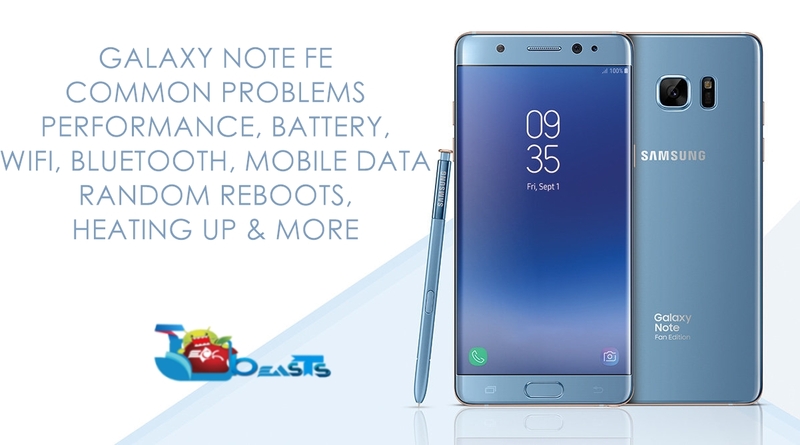 I had a chance to list all common Galaxy Note FE problems and fixes here today. If you are carrying a Galaxy Note FE and it has an annoying problem, you can check this list. If your issue is listed here, the solutions will definitely help you. It’s time to take a look at the common Galaxy Note FE problems and fixes. If your Galaxy Note FE is lagging or its performance has slowed down over the last few weeks, then here are the possible fixes. You have to apply these solutions one by one. Do not apply these solutions all at once. Try clearing the cache of your phone. Reboot the phone after clearing it. If your phone is rooted, clear the Dalvik Cache of your phone. Boot into Safe Mode and check the performance of your phone while having all the Apps disable. If your phone performs well in Safe Mode, it means you need to uninstall recently installed applications. Install a new stock ROM on your phone. If the battery of your phone is draining, or its acting weird, here is what you can do. Charge your phone up to 100%. Now use your phone and let it discharge to 0%. Let your phone die. Charge the phone again up to 100% and let it discharge to 0. Complete 3 such cycles and check the battery performance of your phone. Open Settings > Device maintenance > Battery > Turn on Power saving mode to MAX. Also, tap the “SAVE POWER” button which will close all the unnecessary background apps. Clear the cache of your phone. Use Safe Mode to check if an application is a reason behind terrible battery consumption. If the above solutions do not work for you, factory reset your phone. The last resort is to flash a new stock ROM on your phone. Root access comes with its perk. If you have a rooted Galaxy Note FE, use this guide to calibrate the battery of your phone. Those of you who have a custom recovery, you can delete the battery stats file manually to calibrate it. WiFi connecting and disconnecting? No problem! Try these solutions one by one. Reset the Network Settings of your phone. Check the router if its working fine or not. Perform a factory reset your phone. Flash a new ROM on your phone. Before applying these solutions, check your SIM card. It should be inserted properly in your phone. Check your Mobile Data package as well. If you do not have the Data, you will not be able to connect to the internet. Solution#1: First of all, turn on flight mode and turn it off. Check the Mobile Data now. Here’s another solution you can try. On your phone, go to Settings > Connections. From Connections, open SIM Card Manager. Check if your SIM with Data Bucket is selected in the “Mobile data” option. Now go back to Connections and open Mobile Networks. Make sure that the Network mode is set to “LTE/3G/2G (auto connect)”. If it’s not, then set it. Now tap Network operators and tap Select automatically. Open Network Settings > Reset Network Settings. Here is how to do it. This is a very common problem happening to almost all the Samsung Galaxy handsets. Here are all the solutions that you can try. Use these fixes one by one. Ensure that the SIM card is properly inserted. Make sure that your SIM card is active. Enable Flight Mode and turn it off, check if the error is gone. Open Settings > Connections > SIM Card Manager > Check if your inserted SIM cars are appropriately selected. Now in Settings > Connections > Network operators > Select Automatically. Ensure that your phone’s IMEI is not null. Is the camera not taking good pictures or its failing? Here is what you can do. Try these fixes one by one. Solution#1: On your phone, open Settings > Apps > Camera > Storage > Clear Data & Clear Cache. Reboot your phone now. Solution#2: Clear the cache of your phone and reboot it. Solution#3: Perform a factory reset on your phone and check the camera then. Solution#4: Try using a third party camera application like the Google Camera. Solution#5: Install new software on your phone after performing a factory data reset. Turn on flight mode and turn it off. Reboot your phone afterward. Reset the network settings on Galaxy Note FE. Wipe the Cache of your phone. Ensure that none of the applications installed on your phone are controlling the Bluetooth, for this purpose, you can boot your phone into the Safe Mode and check the Bluetooth. Reboot your phone into the recovery mode and clear its cache. Boot your phone into Safe Mode to disable all the apps. If the phone doesn’t randomly reboot while it’s in Safe Mode, it means one of your applications is causing the trouble. You have to uninstall your recent installations. If you are overcharging your phone, do not overcharge it anymore. Perform a factory reset to give your phone a fresh start. Reinstall the firmware on your phone. The solutions for this problem are similar as for the problems mentioned above. You have to check your phone in the Safe Mode to see if an application is causing your phone’s temperature to go up. If the phone performs fine after it’s in the Safe Mode, it would mean that there is something wrong with the apps. You have to go through all the apps and uninstall one by one to check what fixes the problem. The phones heat up mostly when you are playing games. If your phone heats up too much, you can stop playing the game for a while and let it cool down. Another thing to remember is, never ever put your phone on charging while playing a game. Other options that you have include wiping the cache and factory data reset on your Galaxy Note FE. You may go ahead and install a new ROM if needed. To fix the Galaxy Note FE Touchscreen Issue, follow this guide. Always use original charger that supports Fast Charging. If you are charging your phone wirelessly, make sure that Fast Wireless Charging is enabled on your phone. It’s in the Settings. Use original OEM Data Cable to charge the Note FE. Charge your phone using an electric switch. Charging your phone through Laptop or Car will not fast charge it. Do not overcharge your phone. Now press and hold Volume Up + Home + Power button to reboot. Your phone will reboot into the recovery mode. Use Volume Down to select “wipe cache partition” and press Power button to wipe it. Now reboot your phone into the system. That’s all. Now turn on your phone. As soon as you see the Samsung Logo on screen, press the Volume Down button. Keep the Volume Down button pressed unless you see the home screen. Let the key go once you are on the home screen. You will now find a Safe Mode watermark on the lower left corner of the screen. It means all the applications have been disabled. You can now check if your phone is free of the problem that you were looking for. If the problem is gone, it means an application was causing it. You now have to uninstall your recent installations one by one to fix. To get out of Safe Mode, simply reboot your phone. On your Galaxy Note FE, open Settings. Now in Settings > About Phone > RESET > Reset Network Settings > RESET > RESET. This will take a few seconds to reset the network settings on your phone. Reboot your phone after resetting network settings. All your WiFi, Bluetooth, and Mobile Data settings will be reset now. Setup your connections once again to check if the problem is gone. Power down your Galaxy Note FE. Now turn on your phone by pressing Vol Up + Home + Power keys simultaneously. Your phone will boot into the recovery mode now. Use Vol Down key to navigate to “wipe factory data reset”. Press power button to factory reset now. Reboot your phone and set it up again. First of all, you have to perform a factory reset on your phone. Factory reset will prepare your phone for clean installation. Now follow this guide to install latest Android Oreo on Galaxy Note FE. That’s all. I hope that this guide fixed most of the issues for you. If you are still having any problem, feel free to reach out to me. In case these solutions didn’t work for you and some other solution worked, do not forget to mention it below. Stay connected!